Hi everyone, another lovely day today. Unfortunately I didn't make it to the boot sale today, I decided to spend longer with my lovely Mum instead. It's on again tomorrow due to the Bank Holiday, so maybe we'll pop along then if the weather's still fine. I just couldn't believe how many gorgeous cards were about for the Colour Create challenge this week, which has been set by Mina. I'm often inspired by the cards Mina creates, but judging by the challenge entries, it seems that everyone else has been too. I'm not sure whether it was the colour scheme (one of my favourites!) or something else but I certainly couldn't wait to get started on this one. The image was a digital download I purchased from Sketching Stamper a few days ago. I couldn't resist this and another download (which you'll be seeing very soon!) If you haven't visited before, do take a look as Chris's digi-stamps are just fabulous, I'm getting quite a collection now! Unfortunately, I haven't done this lovely image any favours with my colouring today it was one of those days where no matter what I did it ended up looking worse than before, so another day when you shouldn't look too closely, I'm afraid. I've just been explaining to my dear (and long suffering) hubby, that the reason is probably that my pens are wearing out and I'm sure a small collection of Copics might put things right. He didn't seem to believe me for some strange reason! Thank you for visiting and have a lovely evening. Lol did your DH listen to you that's the important thing. I don't think you could ever make a card that you can't have a close look at and I for one think is lovely. I have several of Chris' digi stamps and lots of others as well I think I am on my way to building nearly as big a collection as my rubber ones. 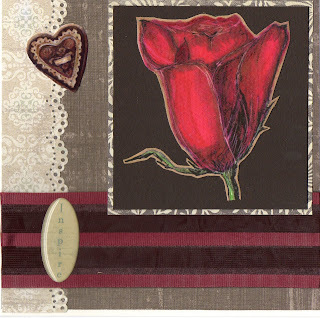 A stunning card Chrissie, the colour combo is gorgeous, I love everything about it. Oh my Chrissie you have so done us proud this week at Colour Create with your stunning card! Your rose is just so beautiful! I can so see why you had to have it and your colouring is so rich and gorgeous! Love your great paper and design and your sentiment is just perfect! Well I think you've coloured this flower beautifully - that doesn't mean to say you don't deserve some nice Copics though. A really lovely card Chrissie. Oooh fab card hun, love the image and those papers are gorgeous! Love the embellies that you have used too! Can I just say, I don't know what you're talking about!! The colouring looks perfect! But keep on at your hubby for the copics anyway!!! Stunning card Chrissie. The digi stamp looks fantastic the way you coloured it, almost like velvet. Wonderful choice of papers too. Thanks for joining the Colour Create Challenge. Great Card., Its fab! Love the rose! Gorgeous work Chrissie - good to see another Sketching Stamper fan!! Stunning and so gorgeous I love the rose. Very elegant card. Love the image beautifully coloured. Lovely colour combo. Really pretty card, perfect for the CC challenge! Wowww Chrissie,what a beautiful card,l love the colour. Hi Chrissie - this is gorgeous. Love your layout and that fabulous rose. Fantastic details, those papers and that heart are beautiful. This is so beautiful and yummy! The colors are rich and I can almost smell that rose from here. Fantastic! Fabulous card. I love the papers and you have colored the image beautifully.